I have been able to keep up with the Bonnie Hunter Mystery Easy Street even if I did not post much the past few weeks. To see the Monday Linky party that Bonnie is hosting Click Here. I know there are a few in other colours. I just love the colours she used and was not going to change it. I now wish my grey was darker. It would show off the chain running thought the quilt better. My aunt used very different colours and used Black not grey. So her chain really shows. Her web site is Smiley Quilter. Seeing my aunts quilt makes me what to change my four patches all to black and not grey. What do you think? Should I fix it? It is a small fix and I would not have too many blocks to unpick to get it fixed. 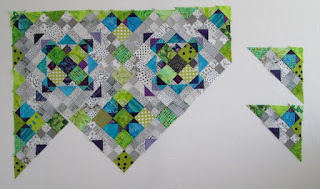 I have also added today's post to Judy's Design Wall Monday Linky Party. I am still machine quilting my show quilt. I plan to get it done and photos done so I can enter it in the Canadian National Juried show. I have to get my entry in the mail no later than Friday. I will be doing tons of hand stitching tonight and the next two days. I can not show you the quilt till I know if it got in or not. Sorry. hi Cathy, certainly darker 4 patches would provide you with the contrast you are looking for, but I think what you have will also create some of its own sutle rhythm. I wouldn't unpick. I too love the colours used and it is fun to see all the great variety in the apple greens. Fingers crossed for your NJS piece. You could fix it if you wanted to, but I think it's just beautiful. I will never again pass up a Bonnie Mystery Quilt!!! Keep it as is, looks great. The subtle grey lets the turquoise shine out. Cathy - I find the grey four patches calming! If you don't like it now, you probably won't like it later. my advice is to unpick or make new blocks. good luck. Hi Cathy your quilt looks awesome! It has been a fun mystery. Good luck with your quilt entry! Looks beautiful Cathy and like you....I wish I had used black but I still like my quilt. This was so much fun! I think it looks great without the darker gray in the 4 patches. I would keep going the way you are. Your Easy Street quilt is beautiful. I do like the darker chains showing, but I also like the subtle lighter chains too. I know, I'm not much help LOL. It was fun working on this with quilters from all over the world.